when you logout via /logout or /quit the client technically sees you leave the raid group so thats why its making a new raid if you alt-f4 to exit it wont happen. ill try to work on a fix to detect the logout and not auto end the raid in that case. mackaque: ill see what i can do right now waitlists are stored via each raid. You could added them to your new raid in a waitlist group i.e. et your waitlist groups to 6-8 and put them in there when you make your second raid or have them re-whisper you. Another point I would like to know if we can do about it is if we want to keep the attendance of our waitlist in Headcount ... the problem I founded is if we start with a raid (Baradin Hold) I ask ppl to msg me for the wait list .. we kill the boss then we switch to another raid (Blackwing Descent) and since they are only in the Baradin Hold raid as waitlist we see them at 50% attendance for the day but they were there all night rdy to help. Is it possible to fix something about this like adding them manually to the other raid so they are 100% of the night or I don't know. Thanks Kagaro, I appreciate all the work that you have done in updating this mod. I'm just having 1 problem still and thats the fact that the raid still resets if i reload or logout for a second. I know you increased the lag interval but is there anyway to further increase it or let us know how to increase the time interval. Thanks kagaro, works perfectly, waited soo long for ace3 headcount. 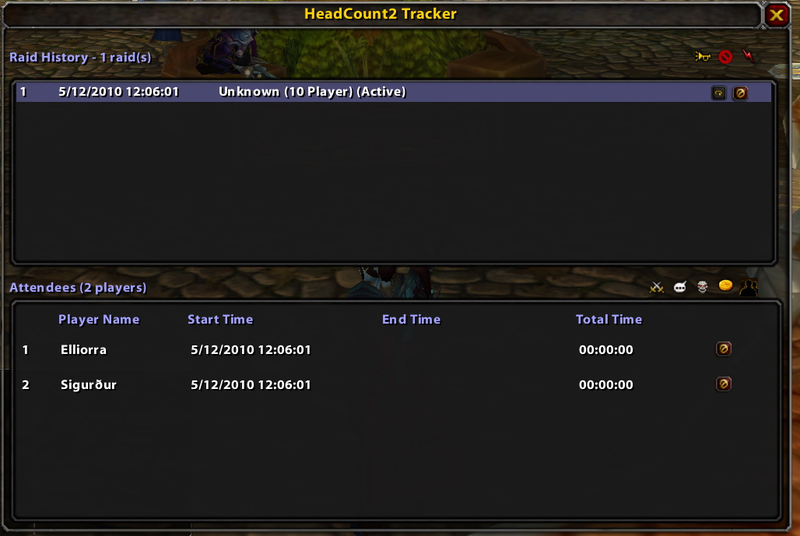 First of all, thanks for a great addon, i just have a small question. Is it/will it be, a possibility to report "Lifetime" attendance list? I have a small question about your addon. gmarco not possible right now. the exporter is custom code to generate each export. is possible to have a custom textarea where we can create a custom export template ? Thanks for this great addon ! However when they typed WL or WL add or anything else i could think of it was simply not adding them to the waitlist database. I have the updated version I was in a raid group am not sure why it isn't working? I'm not sure what is causing my issue with all my raids being deleted randomly. I thought it was that last update, but it has done it again since then. Has anyone else had this issue happening to them? Ill add ISO format this weekend. Have them whisper you wl i.e. Where can I find all the commands?